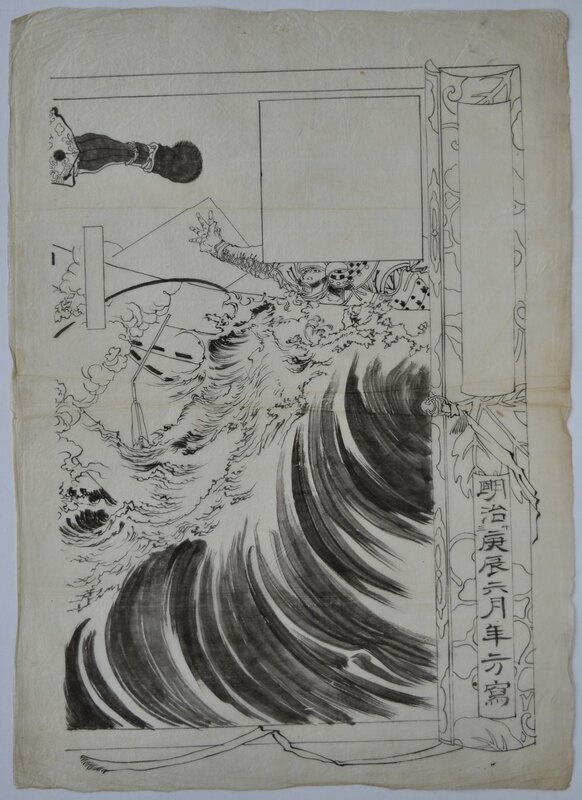 A fine original drawing for the first sheet of a published triptych by Yoshitoshi for the set Dai Nippon shiryaku showing the naval battle of Dannoura in the reign of Antoku, the 80th Emperor. Published 20/4/1880. 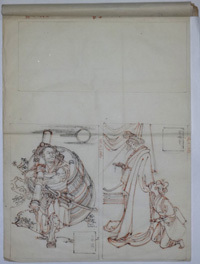 The British Museum has a complete preparatory sketch for this triptych. 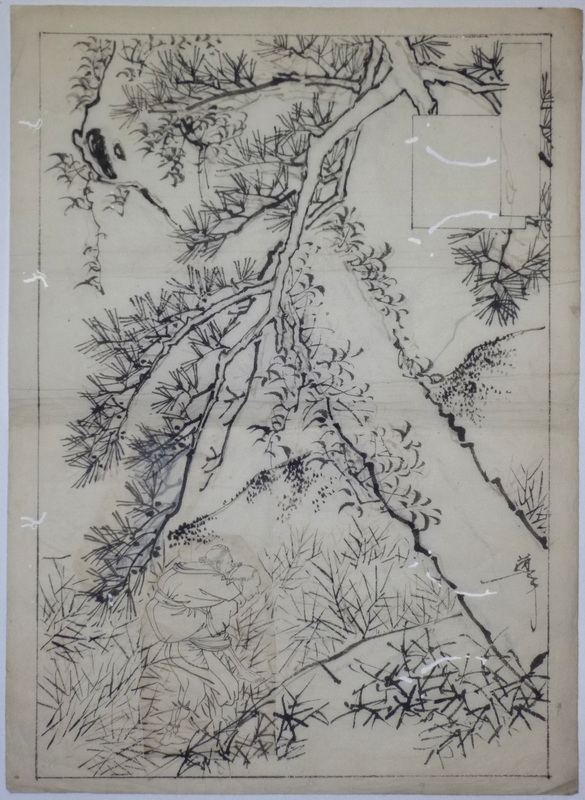 The drawing is signed “Copied by Toshikata” and is dated Meiji kano-e tatsu, 1880. 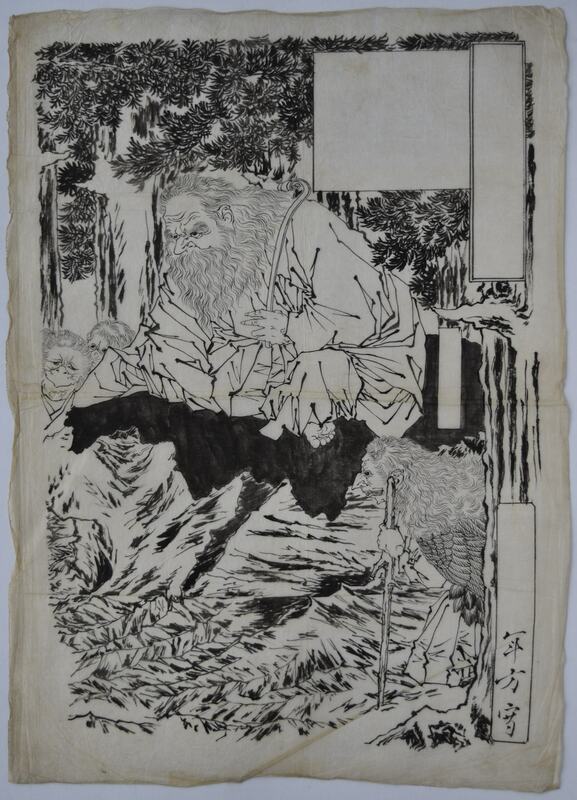 Why Toshikata drew it is a puzzle: Possibly an exercise in preparation to making final drafts for the woodblock. Oban size. Sold as is with some creases. Provenance: From the atelier of Toshikata. A fine original drawing for the first sheet of an unpublished ( ?) 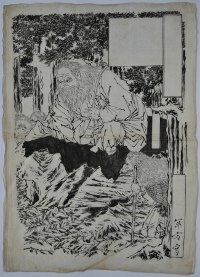 triptych by Yoshitoshi showing the king of the Tengu, Dai Sojobo, teaching martial arts to the young Yoshitsune. 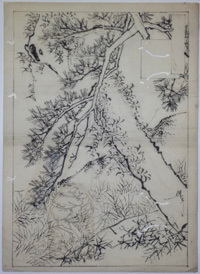 Drawn c 1880. 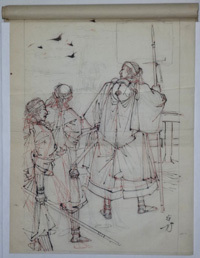 The British Museum has a complete preparatory sketch for this triptych. The drawing is signed “Copied by Toshikata.” It has more detail than the BM example but why Toshikata drew it is a puzzle: Possibly an exercise in preparation to making final drafts for the woodblock. Oban size. Sold as is with some creases. Provenance: From the atelier of Toshikata. A collection of approx. 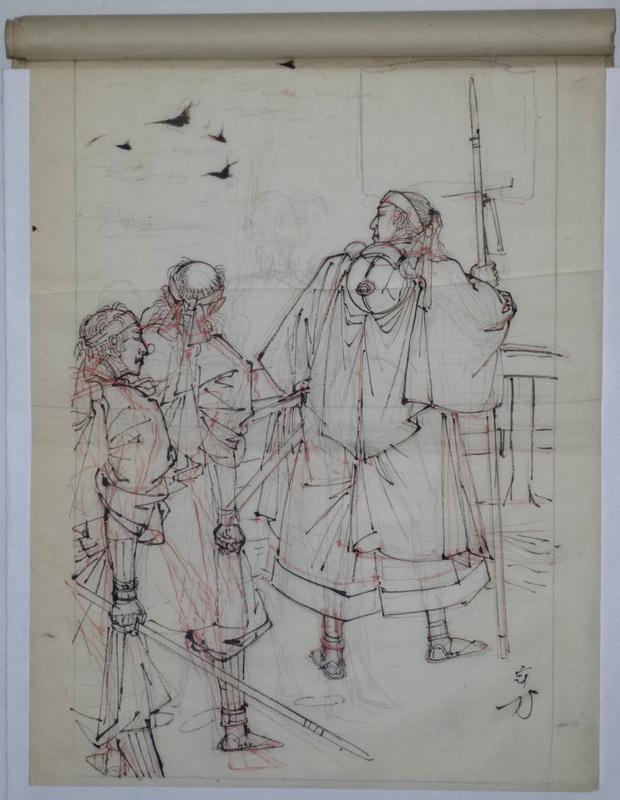 36 drawings by and from the collection of Mizuno Toshikata. (Four pages shown. ) Bound with paper string on thin paper, sumi and red ink. Cover with Toshikata seal. Various historical, domestic and social subjects. 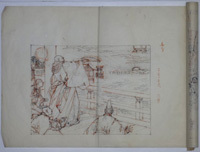 An interesting study group by Yoshitoshi’s best pupil ( who later studied with Watanabe Shotei ). Album size: 10 x 13.5 in; 25.5 x 34.25 cms. 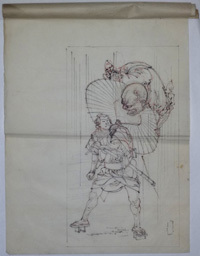 The drawings in various sizes but no larger than the album. Generally good condition. 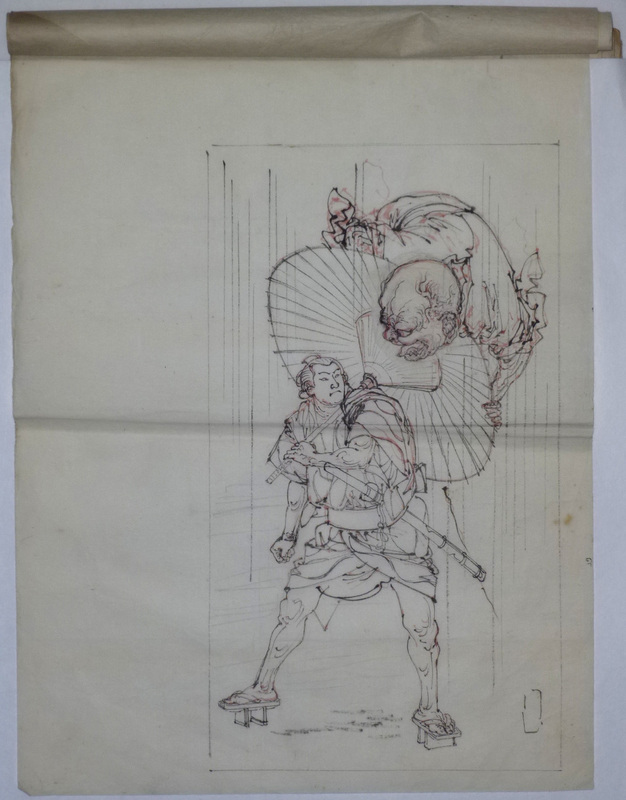 The original preparatory drawing for a triptych published by Matsuki Heikichi, 1898, showing Tadanobu ( one of Yoshitsune’s men ) fighting the priest Yokogawa Kakuhan in Yoshinoyama. Sumi and light red on thin paper, each sheet 15 x 10.5 in; 38 x 26.5 cms. First sheet signed Gekko. Extremely good condition. Ex collection Mizuno Toshikata ( the artist, 1866 – 1908 ). 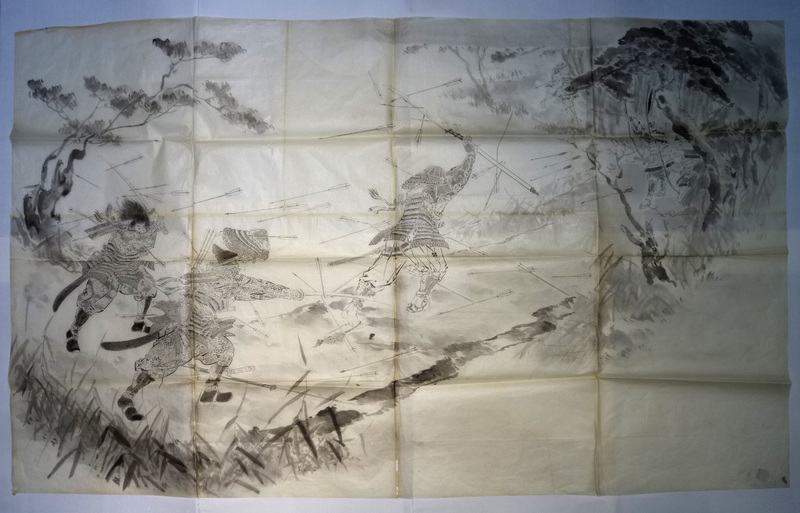 A large cartoon, sumi on thin paper folding out to 25.5 x 42 in; 65 x 106.5 cms. The subject is the Last Stand of the Kusanoki Clan. 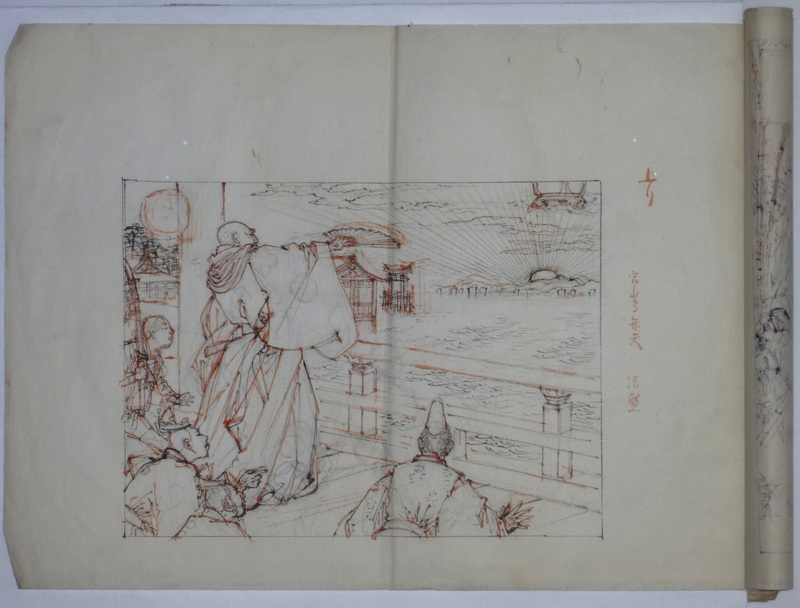 In fact Gekko designed a triptych of this subject in 1890 which is very similar to this large drawing. Why he made this large version is not known: Perhaps he was intending to make a painting or he just liked the subject. Very good condition. Ex collection Mizuno Toshikata ( the artist, 1866 – 1908 ).